ExtraShopper is an advertising-supported browser add-on which we have categorized as adware because this program displays questionable third-party advertisements. ExtraShopper is advertised at extrashopper.info and is aimed at delivering the best online deals to you. We recommend that you remove ExtraShopper from the computer because the creators of the program accept no responsibility for the content of the advertisements sent to your browsers. As a result, you use the program at your own risk. ExtraShopper is based on the JustPlugit browser add-on creation engine, which is well-known to security researchers due to multiple similar and identical programs, including RocketCoupon, Saveitcoupons, RoyalCoupon, and many others. All these programs fall to the category of adware and are removed from the computer by powerful security programs, and you should install one, too, if you want to be sure that you are safe when browsing the Internet. In some cases, you may not notice when ExtraShopper gets installed because you may not receive any notification about it. This stealthy installation is called silent installation; hence, the system should always be protected against malware and spyware programs. ExtraShopper generates advertisements on shopping websites and many other websites. However, the content of the advertisements may be unrelated to the content of the website or your interests. ExtraShopper randomly displays advertisements promoting software programs, quizzes, online scanners, updates, etc. We advise you against relying on such advertisements because they may be associated with unreliable websites. Due to the fact that ExtraShopper does not endorse the websites advertised, you should reconsider whether you really want to keep this browser add-on on your computer. Bear in mind that, like other adware program, ExtraShopper is capable of monitoring your online behavior. The program records your clicks, impressions, search terms, browsing history, browser language, browser settings, and some other non-personally identifiable details. This feature is typical of basically every advertising-supported browser add-on, which means that you should be very careful when dealing with such suspect shopping assistants as ExtraShopper. Information about you is being collected for several purposes. One of them is to find out your browsing behavior and provide you with new advertisements that match your interests. In order to do so, the information collected may be shared with third parties. It is also worth mentioning that some identifiable information may be recorded by the adware program, which is another reason why you should not delay the removal of ExtraShopper. Our instructions provided below will help you uninstall the program; however, after uninstalling the program, you need some help to fight off malware and spyware attacks. We recommend that you implement SpyHunter because this security program can eliminate the unwanted program and safeguard the system against browser hijackers, Trojan horses, adware programs, ransomware infections, and many other threats. 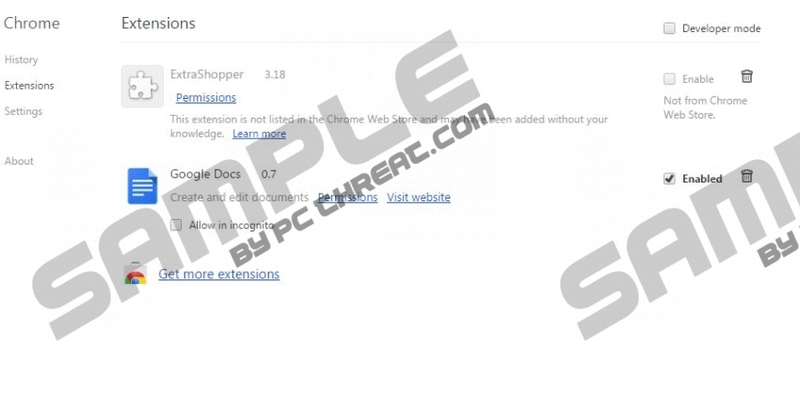 Select the Extensions option and remove ExtraShopper. If you want to be sure that the files of the program are deleted, invest in a reputable security tool. Below you will find our recommended scanner, which is available at no charge. If necessary, invest in the program to have the system protected against malware and spyware. Quick & tested solution for ExtraShopper removal.